When one child goes missing on the Falkland Islands, both police and locals chalk it up to the dangerous environment and many island cliffs. When a second--and then a third--disappear, it's impossible for the locals not to suspect that something more dangerous than cliffs and rocks is afoot. But how does a town as small and remote as Stanley cope with such a terrible possibility? And what other secrets lie hidden across the islands? Sharon Bolton (Sacrifice, Now You See Me) unfolds the events of Little Black Lies in three parts: first through the eyes of Catrin, a woman mourning the death of her two sons in a freak accident; then Callum, a soldier in the Falklands War suffering from PTSD; and finally Rachel, Catrin's once-best friend and the woman responsible for the death of Catrin's sons. The shifting perspectives are clear and intentional, and reveal three characters pushed to the edges of any reasonable limitations by grief and fear and guilt. The three narratives weave together against the harsh and starkly beautiful landscape of the Falklands, resulting in a novel that is as brutal as it is startling. 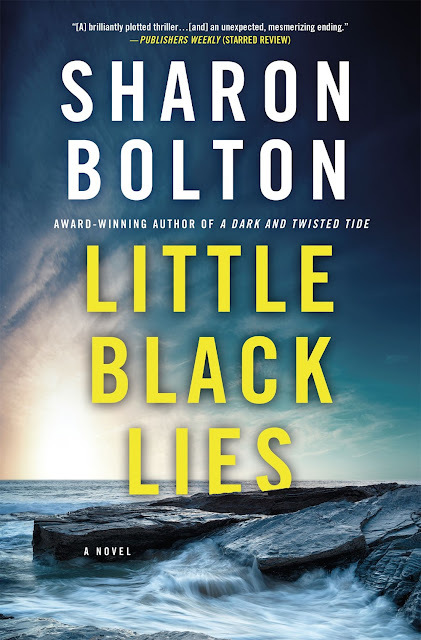 Bolton's skills as a writer of mysteries are on full display in Little Black Lies: she has brought to life the distinctive character of an isolated place; built interesting, multi-layered characters; and paced the revelations of each characters so perfectly as to keep readers always guessing. For more on this book, see my interview with author Sharon Bolton in Shelf Awareness for Readers.